From November 30 until December 2, the UBC Museum of Anthropology hosted an exhibit entitled Transformation Mask, showcasing a piece of art that was crafted through a collaboration between Heiltsuk artist Shawn Hunt and Microsoft. Hunt offered The Ubyssey more insight into his background as an artist, his latest creative collaboration and how he incorporates technologies into traditional art forms. From a young age, Hunt was a creator. “I grew up with an artist father. My dad’s studio was at our family’s home, so I was constantly around a working artist. My mother saw that my brother and I were creative children and always encouraged our artistic development from a young age,” Hunt wrote in an emailed statement to The Ubyssey. This creativity continued into adulthood, as Hunt completed the studio art program at Capilano College and a BFA at UBC before beginning his professional career with his father as his mentor. Ten years later, Hunt began an apprenticeship with Vancouver-painter Lawrence Paul Yuxweluptun. Hunt received this exposure when he was invited to come to The Garage, a Microsoft makerspace and engage with the technology available there. While he originally thought his ideas might be too complex, a team of ten volunteers got involved in the production of the piece in order bring his concepts to fruition. 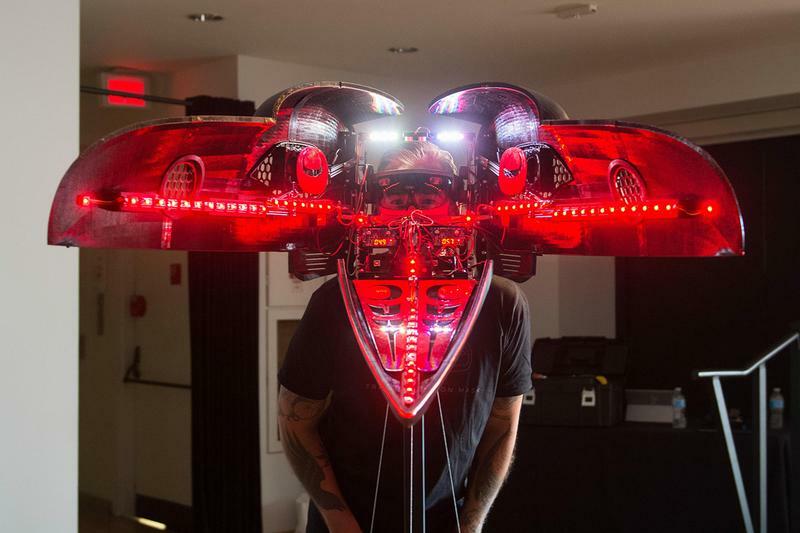 The “Transformation Mask” moves away from the typical forms of Indigenous art with its incorporation of Microsoft HoloLens technology, but Hunt said that Indigenous artists have always embraced new technologies when creating artwork. While masks in museums often sit in glass cases, traditionally they are intended to be worn ceremonially. Those are Hunt’s underlying intentions with “Transformation Mask” — to share his heritage with the non-Heiltsuk community. As for his community back in Waglisla (also known as Bella Bella), Hunt hopes that his piece will inspire them to share their thoughts in new ways. As for Hunt, he hopes to continue his collaborations with Microsoft.